1. Are there any trails accessible directly from the Iron Horse property? Answer: Yes. Leaving Iron Horse, you will need to cross a two-lane paved county road to access a single-track trail along a power easement. 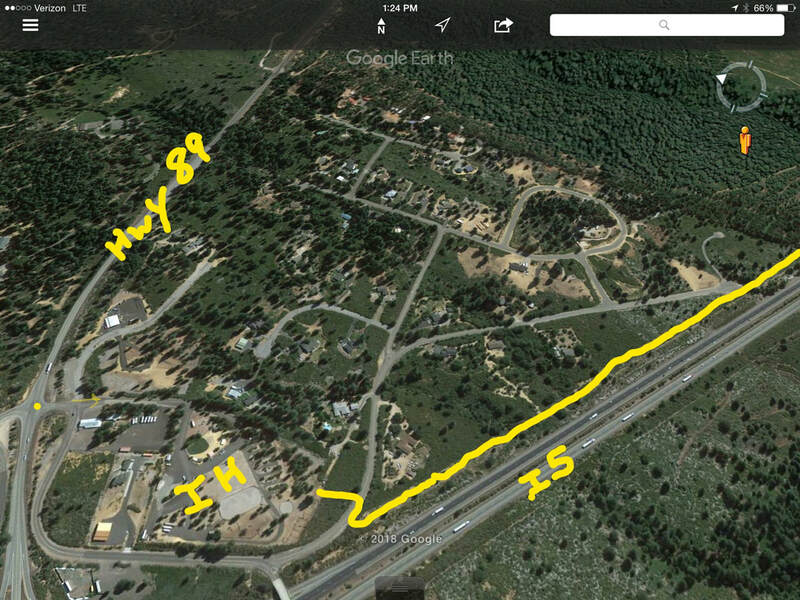 This trail parallels Interstate 5 and in about 15 minutes takes to the end of Azalea Road. From here you ride a short distance on a jeep type road which accesses several loop trails. These vary in length, with a minimum ride of about an hour— however by looping around different ways, you can really ride this area for as long as you like. To access old roads and trails north of Iron Horse and highway 89 you must be prepared to cross highway 89. This can be a busy highway, and we do not recommend you cross on horses at the Iron Horse entrance. There are areas east of Iron Horse with fairly good visibility but extreme caution should be used. It is possible to reach the Pacific Crest Trail from Iron Horse. Iron Horse is not responsible for your outings off the property and advise caution when crossing roads and highways. There are many quality trail opportunities short trailer rides away. 2. What are the trails like? Answer: Most of the trails accessible from Iron Horse are old Forest Service roads that were used at one time for logging operations. Some are very overgrown and/or eroded so they feel much more like a trail. Most are dirt with very little rock, although, there are some areas of rock. Most of the riding is fairly level, to gently sloping. Trails on the south side of highway 89 are fairly flat gentle terrain. Crossing the highway gives you the opportunity to gain elevation gradually. 3. Are their water crossings? Answer: There are no water crossings riding off of the property. There are trails in the area (by trailer) that are adjacent to water with access to water. Answer: Dogs are not restricted from trails however County leash laws may apply in some areas. Leaving Iron Horse by horse however, does require crossing busy paved roads and highways. Dogs are also welcome at Iron Horse as long as they are kept in campsites and do not become a nuisance to others. You must clean up after your pets. 5. Does Iron Horse have shower facilities? Answer: Iron Horse has an free-standing outdoor type shower facility. Note these facilities only operate during the summer months and water is solar heated and must be used sparingly. 6. Are their maps of trails? Answer: Simple hand drawn maps are provided on site, along with a notebook that has directions to many destination rides in the area. Please check this out at the "Welcome Board" inside the Iron Horse property. Some loops are mapped giving approximate ride times. In some areas you will find flagging to guide your way. 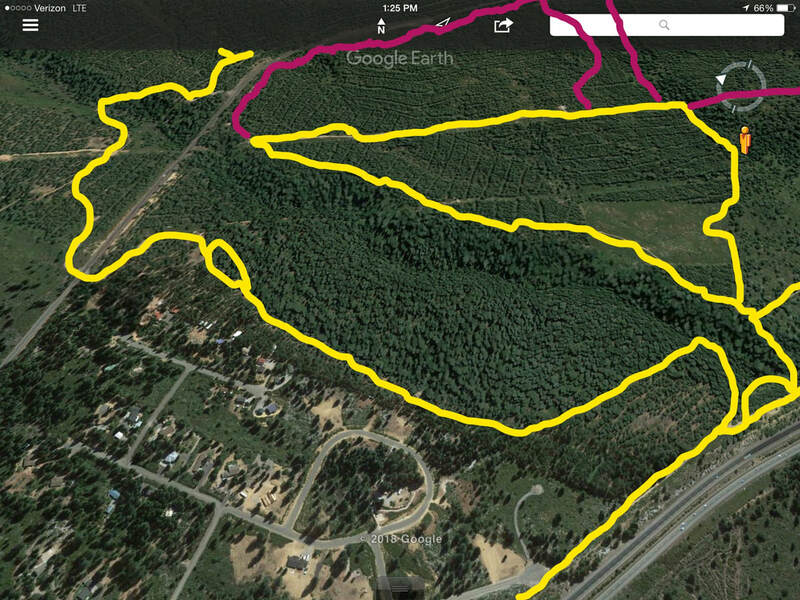 Not all trails are mapped and/or flagged. You may find it to your benefit to use a navigation tool such as a free app on your phone (for example, Map My Tracks). There are other programs as well, some with a fee. You can also purchase a Shasta-Trinity Forest Recreation Map at the local Ranger District in downtown Mt. Shasta. Be advised, however, all the old roads and trails are not on these maps. Siskiyou county in general has an abundance of old Forest Service logging and public roads. With a Forest Service map, you will find many of these roads and you can create your own adventurous outing! We advise the use of a GPS or map assistant in any case, as it’s sometimes easy to get turned around as you continue to follow along old system roads. Also, be advised that much of the land in Siskiyou County is “checkerboard” meaning public lands and private lands are intermixed. 7. What type of bathroom facilities are there? Answer: We have clean portable bathroom units with wash stations. 8. Are camp sites pull through or back-in? Answer: All camp sites are back-in; with horse pens located at the rear of your site. 9. Do we need to bring a water bucket for your horse? Answer: You must provide a water bucket for your horse and we advise you bring your own hose. You also might consider bringing a feed bin. 10. Do we need a wheel barrow and can we put bedding in our pens? Answer: Iron Horse has two wheel barrows on site to remove manure from pens. It is mandatory that you clean your pens daily and leave them as you found them when checking out. We do not provide manure forks however, so please bring your own. Additionally, if you horse creates holes, we ask that you fill them in to level the pen as you found it, so a rake might be called for. We do allow you to put bedding materials in your pens if you wish, however pens must be completely cleaned out when you leave. Answer: Iron Horse has trees scattered throughout the campsites, however, some sites have more shade than others, and of course the shade moves throughout the day. 12. Are their fire pits or picnic tables? Answer: Iron horse does not allow campfires, except in the large fire pit located in the main event area. Our camping guests are welcome to use this pit; however, you must bring your own firewood. Gathering firewood on site is not allowed. We do not currently have picnic tables in individual camp sites, so if a table is needed we recommend that you bring your own. 13. Is there garbage service at Iron Horse? Answer: We currently do not have garbage service at Iron Horse. At this time, you should plan to pack your garbage out. We do occasionally have bears and other wildlife, so food should not be left out at night, or brought into a tent with you. 14. How long are the campsites and can you park more than one trailer in a site? Answer: Most of the sites are about 90' long, however sites # one, two and nine are shorter. You may park multiple vehicles in a site for no additional charge as long as they can fit single file and do not block roadways or disturb vegetation or landscaping. 15. Is tent camping allowed? 15. Can we bring portable corrals, high lines, or tie horses to the trailer? Answer: We do not allow portable corrals, high lining of horses or tying to the trailer all night. We also do not allow more than one horse per pen in the campsites. We do have select pens that MAY be available to house multiple horses, however this must be approved when making the reservation. 16. 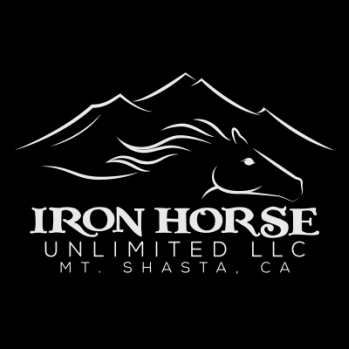 Do you have a septic dump station at Iron Horse? Answer: We do not have a septic dump station at Iron Horse, however, a short distance away you may, for a fee, dump at the KOA. Alternatively, if needed, it can be arranged to use the company who services our portable toilet units. You would need to make arrangements with us, as this is only done on specific days. Answer: Check in is at 2 PM and check out time is at 11 AM, unless other arrangements are made with management.